This month is not only our wedding anniversary, but also the first anniversary of moving to Sapphire Ridge. I can't believe it's been a year already. Sapphire Ridge has been good to us as a family. My kids have found some great friends. I have been able to start a wonderful hobby of gardening. And Roxy, (the dog) has a large yard to explore. However, when you look around, not much has been done to the place. With the exception of the kid's bedrooms, the walls are still the same eggshell colour. I have put nothing up on the walls except my son's works of art. We I haven't done anything to personalise this place. You see, a year ago I had promised to make a slipcover for this ugly couch and it's big brother (Big Brother is ten times as ugly with rips and holes in the cushions). I started to make it. It was going well. I tucked, pinned, cut and even did some sewing. Then it got pushed aside. 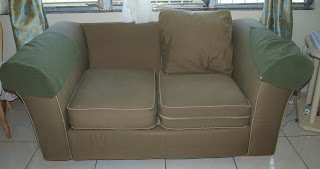 My husband kept nagging asking me when would the slipcover be finished. I gave him several definitive dates that have since passed. So, as a result, he has forbidden, that's right forbidden me to do any sort of diy, painting or decorating of Sapphire Ridge until I complete the two slipcovers. Hence the original eggshell walls. I'm going to finish those slipcovers. It won't take me that long. It's a simple project. I'll finish them this summer month. Really, I will. Promise...cross my heart.